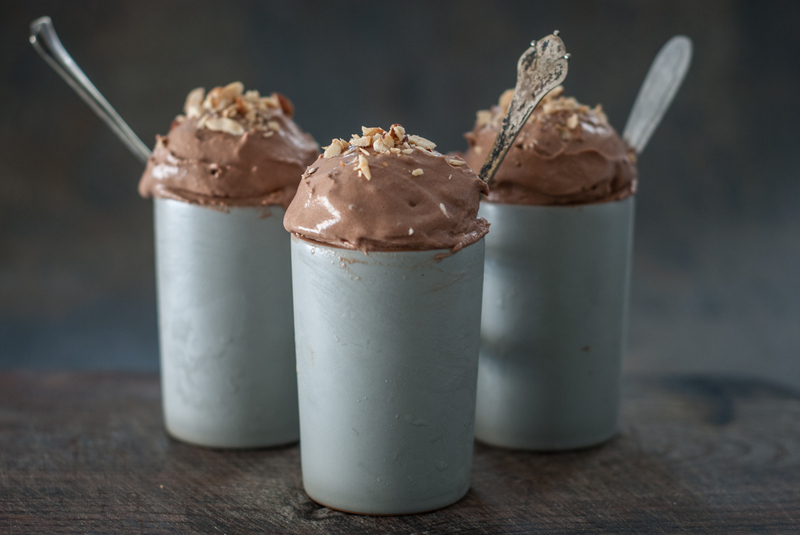 This creamy non-dairy chocolate hazelnut ice cream (vegan) is one of my favorite treats. 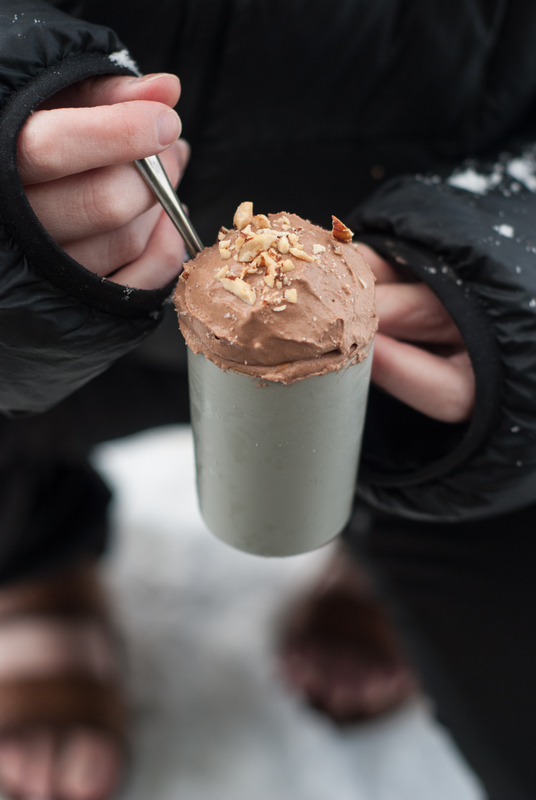 I realize it doesn’t make any sense to do an ice cream post when it’s frigid outside. The truth is I wanted to post this recipe for my son and his wife (you’re welcome, Ry). The other reason is that I’m in that Valentine Chocolate mood. You won’t believe that it is dairy and egg free. It’s just as creamy as any dairy based ice cream that I make. I happen to have some Lactose intolerant members of my family along with a couple that are vegan. This recipe keeps everyone happy. Best of all my husband can’t tell the difference and we aren’t going to tell him…are we? 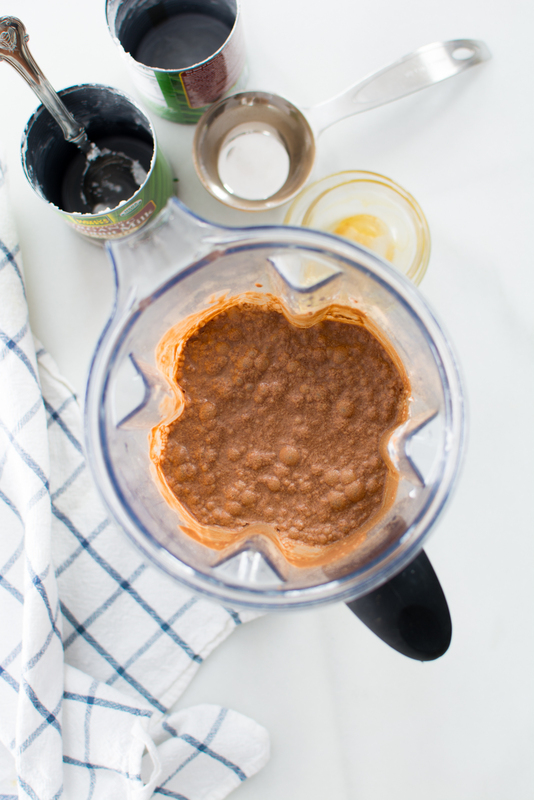 All you will need is a blender and an ice cream maker. 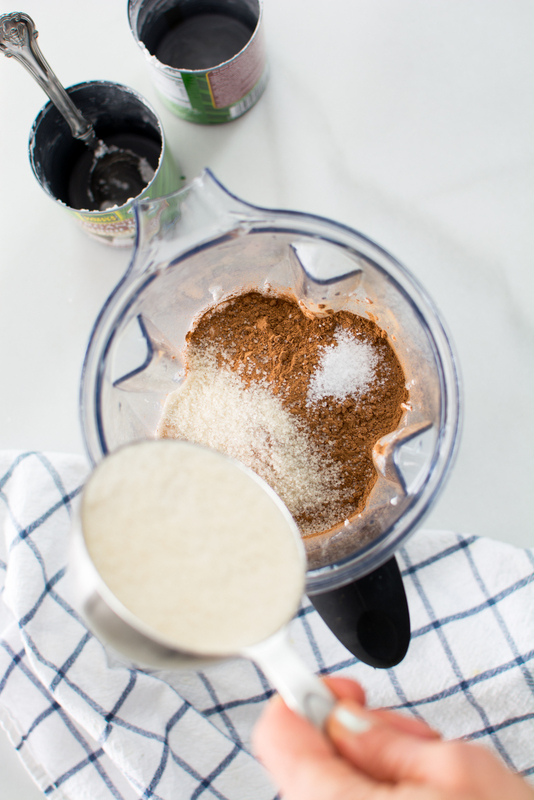 In a blender or a mixer add the coconut milk, cacao powder, cane sugar, salt, vanilla and agave. Turn blender on slowly until mixture is pretty much mixed together. Then turn it to medium/high speed and continue to mix for 1-2 minutes to allow for the sugar to dissolve. 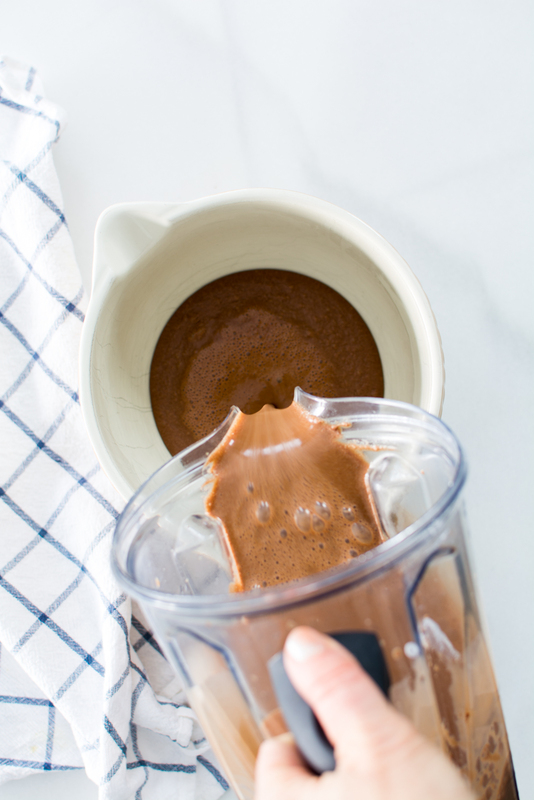 Pour into a container and refrigerate for a few hours or overnight. 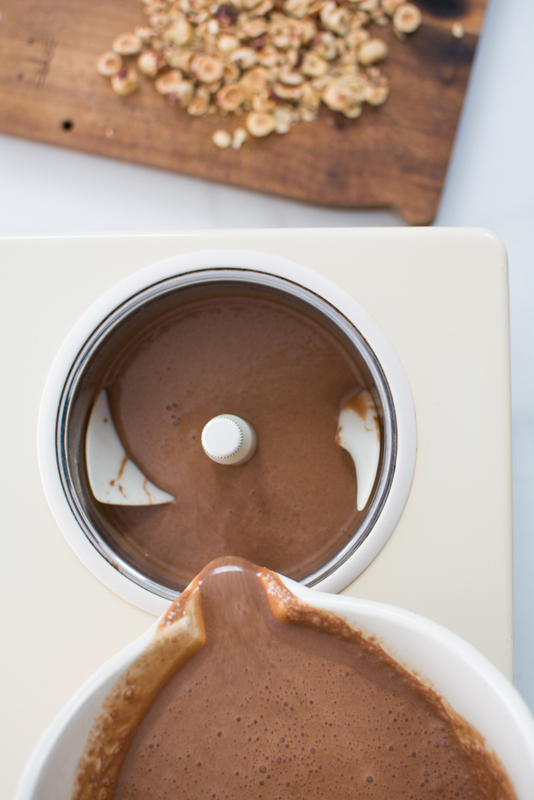 When ready to freeze remove mixture from the refrigerator and pour into your ice cream maker. If you are using a container that needs to be frozen, remember to freeze a good 24 hours. Then follow the manufacturers directions for your particular machine. 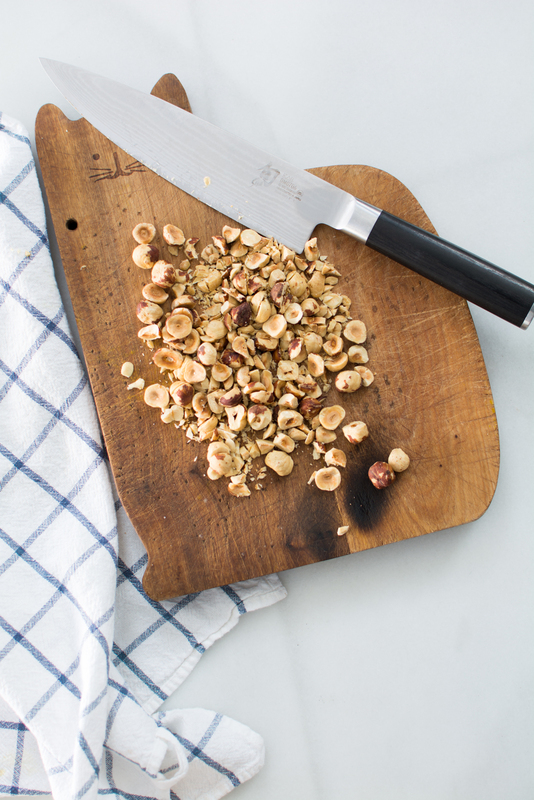 Add chopped hazelnuts. You can add more or less that the amount I use. 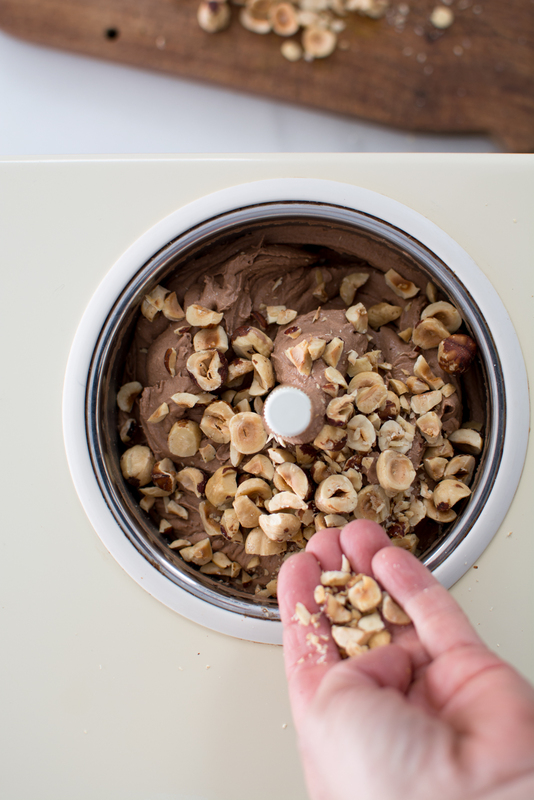 Continue to run ice cream maker just until nuts are mixed in. Scoop ice cream into a container and freeze until ready to serve. I personally like the soft texture that it is just as it completes freezing. If making ahead, plan on letting the ice cream sit out at room temp for about 10 minutes to soften a bit. Coconut ice cream freezes harder than dairy ice cream. For kicks and giggles check out these awesome Butter Almond Fudge Popsicles made with coconut milk, dates, almond butter. Poured into a popsicle mold and drizzled with chocolate and tasted almonds. YUM! 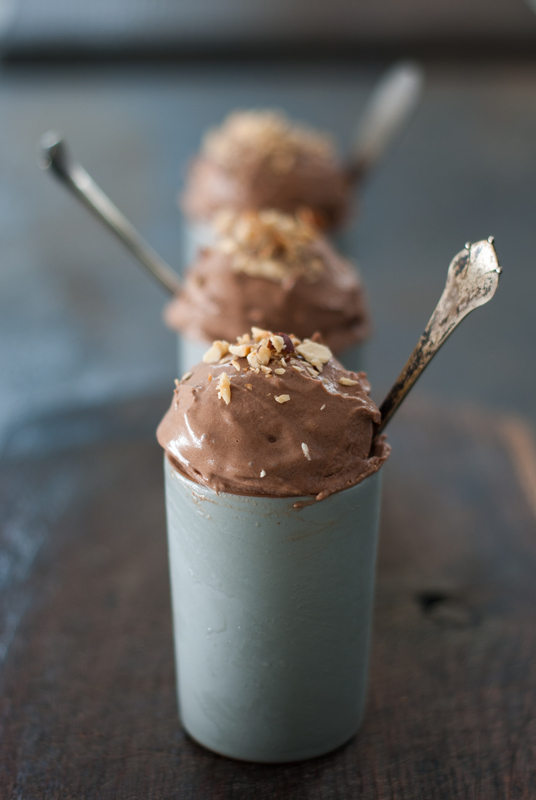 Vegan coconut chocolate ice cream studded with toasted hazelnuts. 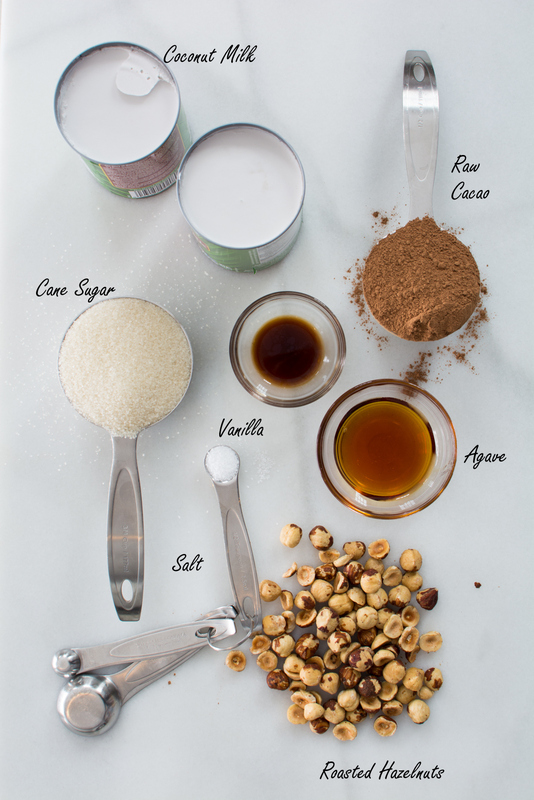 Place all of the ingredients in a blender, except for the hazelnuts. Slowly turn on blender until the mixture comes together. 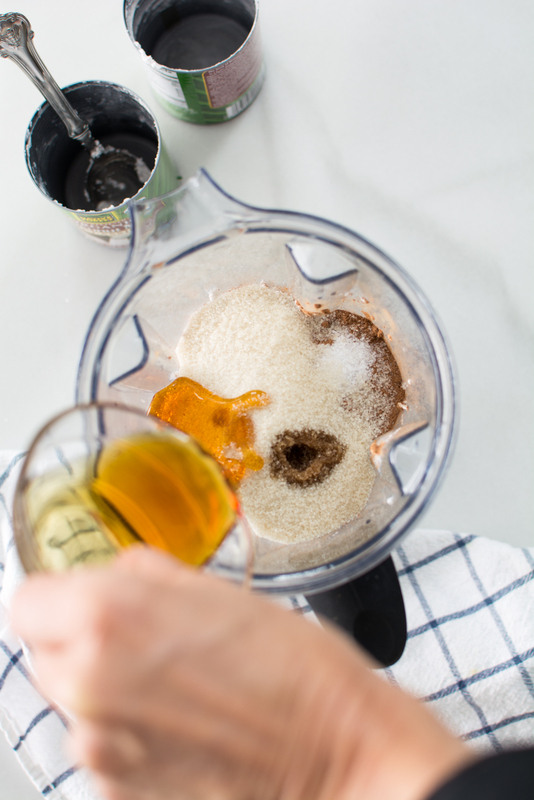 Increase the speed to medium/high and blend for 1-2 minutes to help dissolve the sugar and make everything nice and creamy. Pour into bowl and refrigerate for 3 hours or overnight. 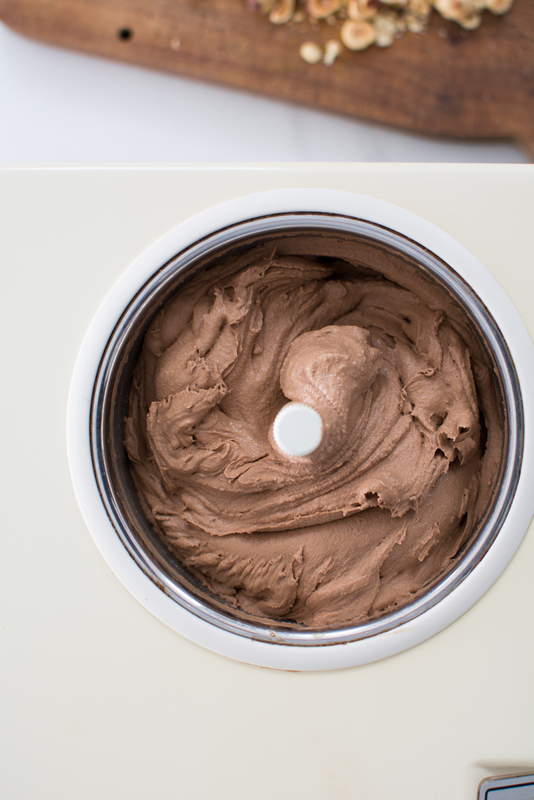 Freeze in an ice cream machine and follow the directions for your particular manufacturer. 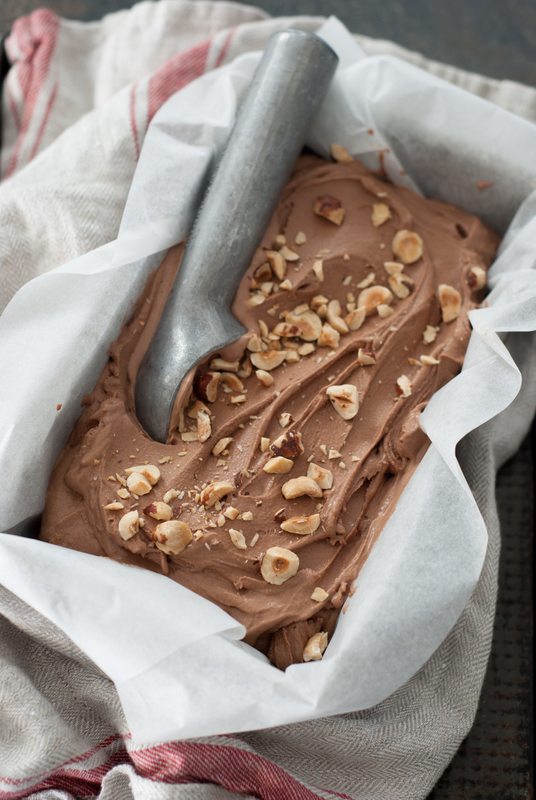 Once the ice cream is almost frozen, add chopped hazelnuts and continue to freeze. Remove to another container and place in the freezer. Eat right away or freeze for later use. Makes 1 1/2 quarts. Here is a behind the scenes shot with my daughter holding the ice cream. Yes, she is wearing sandals and a down coat and yes, she is in the snow. We’re crazy. Such fun. I shoot most of my pictures in my garage because I really like the lighting. It was probably 20 degrees outside while shooting. The up side is that my ice cream didn’t melt…at all! No dripping. No putting the ice cream back in the freezer to reset. The ice cream stayed the perfect. This ice cream really is amazingly yummy! Thanks for the recipe. We eat ice cream all year here in colorado. Thanks for your comment. I sure wish Utah was having 60 degree temps right now instead of 18.